Les Misérables is based on the musical by the same name, which is in turn based on “Les Misérables,” the 1862 French novel by Victor Hugo. The film is set in 19th century France and follows the story of Jean Valjean (Hugh Jackman), a former prisoner who becomes mayor of a town in France. 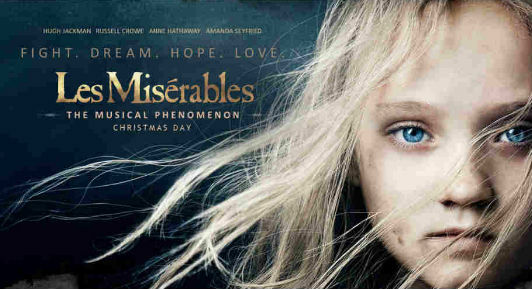 After a series of events, Valjean agrees to take care of Cosette (Amanda Seyfried), the illegitimate daughter of Fantine (Anne Hathaway) and must avoid being captured again by Javert (Russell Crowe), a policeman. And all the while, the country is on the brink of revolution! With a story this complex, and with characters so intertwined, it’s no wonder the movie runs for almost three hours. But besides the run-time, something else separated this movie from the countless others like it: the entire musical was sung … and it was done live. Normally, in a movie-musical, actors record the soundtrack months before the actual production of the movie. Then, when filming scenes, they will play the soundtrack, and the actors will mime the lyrics. But such a unique production like “Les Mis” leaves room for an ocean of opinions. And it was this fantastic story and the dedication of the actors that came together to pack such an emotional punch. Curious to see what all the hype is about? See the official trailer here! You can also get a behind-the-scenes look at the making of “Les Mis” here!